A private road leads you to a 71 acre working ranch cattle ranch. There is a 1 acre pond stocked w/ Koi & Goldfish. A 3605 sqft 4 B/R 5 BA main living home & a terrific 2864 sqft separate farm house service & support the house. Beyond the entryway foyer, you'll discover an elegant kitchen with rich granite counters, gorgeous cherry cabinetry, SS appliances & lovely eat in nook overlooking the grounds. Family room boasts an entertainment center complete with gas fireplace. Separate level Master suites offer luxury baths, sitting areas & walk in closets. Huge enclosed pool area includes fine pavers, 2 large covered areas & gorgeous custom stone waterfall. The ranch house features a family room, kitchen & large bedroom accommodations. Property has 10 clean stables & 35 to 45 head of cattle. 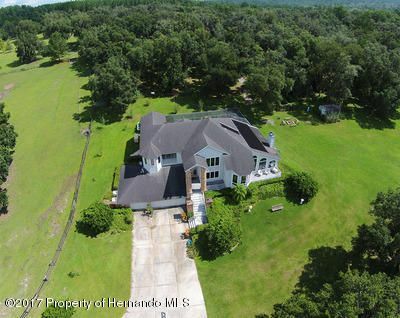 I am interested in 21251 Moore Road, Brooksville, FL 34604.